Many maps use overlays to display different types of features on the map. Many examples show old hand drawn maps that have been re-projected to fit on our modern day, online ‘slippy’ map but very few show these overlays over time. In this tutorial we are going to explore animations using the Google Maps iOS SDK to show the current live weather conditions in the UK. The Met Office is responsible for reporting the current weather conditions, issuing warnings, and creating forecasts across the UK. They also provide data through their API, called DataPoint, so that developers can take advantage of the live weather feeds in their apps. I’ve used the ground overlays from DataPoint to create a small iOS application, called Synoptic, to loop around the real-time overlays and display them on top of a Google Map, very handy if your worried about when it’s going to rain. I always find it interesting when these tutorials show you what we’re going to create before digging deep into the code so here is a small animation on the right of the page of what the end product should look like. 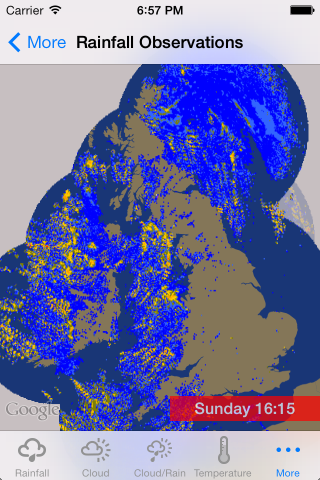 What you’re looking at is the real-time precipitation, or rain, observations for the UK on Sunday 19th January 2014. It’s been quite sunny in London today so much of the rain is back home in the North. You can grab a copy of the code for this tutorial from GitHub. They’re a few things we need before we can start putting the data onto the map. Firstly, you’ll need an API key for Google Maps iOS SDK and you can access this by turning on the SDK from the Cloud Console (https://cloud.google.com/console/). If you haven’t created a project yet then click Create Project and give your project a name and a unique id. I have a project called TestSDK, which I use when I’m playing around with various API’s from Google. Follow the instructions on https://developers.google.com/maps/documentation/ios/start#the_google_maps_api_key for getting your key. If you’ve downloaded the code from GitHub then the bundle identifier is set up as com.stevenjamesgray.Synoptic. You’ll also need to sign up for a key for DataPoint. Once you’ve registered for the API they’ll email you a key and your good to go. When you have your keys and source code then open the project in Xcode and copy and paste your keys into Constants.m (it’s in the Object folder). If the keys are valid then you’ll be able to build and run the project and you’ll start to download the overlay images and they’ll start to animate. I’ve already setup the mapView in the project but if you haven’t used the Google Maps iOS SDK before then you should check out Mano Marks excellent HelloMap example on Google Developers Live. This will get you up to speed with creating a MapView and linking it into your project. The only extra part I’ve added is a custom base layer which will be covered in another blog post. If you copy the URL and paste it into your browser along with your key you’ll find that this JSON file lists all the layers that are available from the Met Office and where you can fetch the images from the server. For observations we fetch the LayerName, ImageFormat (for us on iOS it will be png), the Time of the image (the timestamp of the image given by the time array – watch out for the Z on the end) and most importantly our API key. Once we have constructed this URL we fetch the image. //We didn't get the image but that won't stop us! This code fetches the images asynchronously and adds them into an array for us to use later in the code. We start a timer to check that we have downloaded all of our images before starting to loop around the images on the map. The observant reader will notice that if we use loop around this array of images then they would be out of sync as we don’t know what order the images are downloaded so we need to sort them before we show them on the map. This happens inside our checkAllImagesHaveDownloaded function. This is called every second and checks that all the images are downloaded. If we’ve got all the images then we clear the timer, sort the array and then kick off the animation on the map. We sort the array using a Comparator which will compare the timestamps of each of the objects and orders them in asending order. Increment the counter and check that we haven’t got to the end of the array, if we have then we reset the counter and then wait a second until updateLayer is called again. If we run the code like this after we’ve looped around all the images we would get something that looks like this. The app is now adding and removing the layers correctly and giving us the illusion of animation on the map.